Ask a room full of children, "Who's seen a parade? ", and you'll see dozens of eyes start to sparkle. A parade?!! What fun!! 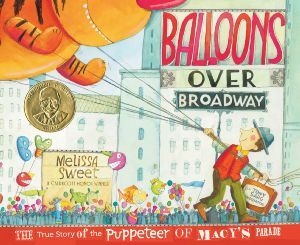 One of my favorite books to share at this time of year is Melissa Sweet's Balloons Over Broadway. It tells the story of Tony Sarge, the puppeteer who created the original giant balloons for the Macy's Thanksgiving Day Parade. Whether you have the chance to see this parade in person or watch it on TV, this book will delight families with its story of creativity and invention. Ever since Tony Sarge was a boy, he loved inventing creative solutions to problems. Sweet hooks readers right from the beginning with the snippet of Tony as a child inventing a way to use pulleys to open the chicken coop early each morning while managing to stay in bed. Tony Sarge was truly a creative inventor who looked at new ways to do things his whole life. He brought his puppet making skills first to London, and then to New York. It was in New York that Macy's asked him to put on a parade, which Sarge did with delight. Children love thinking through Sarge's dilemmas with creating puppets for his parade. How can he make them big enough for everyone to see? How can he carry them down the streets if they are that large? How did he get his ideas? Melissa Sweet shows just the right amount of clues that kids put the pieces together themselves, feeling Sarge's "ah-hah" moment for themselves. Her artwork is full of joy, creativity, and clear history as she leads children through Sarge's life. I enjoyed reading this interview with Melissa Sweet over at Monica Edinger's column at the Huffington Post. Monica asked Melissa to tell readers a little bit about her process creating the art. "Melissa Sweet: My studio is full of old toys, fabric and found objects I've collected. I started making quirky toys and paper-mache puppets using the materials I had on hand. People often ask which comes first, words or pictures, and in this case making these objects taught me about Tony's creative process and helped me figure out an angle to tell the story. I knew I wanted a 3-dimensional aspect to the art to give the feel of what Tony's studio might've been like." For more resources, be sure to check out the Classroom Bookshelf Blog. Grace Enriquez has assembled everything from suggestions for bringing this into the classroom (as a biography, as a unit on puppets, as a study of community parades, and more) to online resources including Melissa Sweet's activity kit, the official Macy's Thanksgiving Day Parade website, and many more. Also make sure to check out the great collection of primary resources over at Seven Impossible Things Before Breakfast - Melissa Sweet shares original video from the Macy's Parade in the 1930s, photographs of Tony Sarge and his puppets, and some of her early sketches from the book. 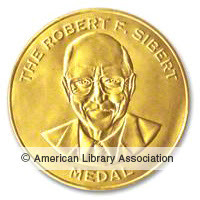 If you like sharing nonfiction with your children, be sure to check out the Robert F. Sibert Informational Book Medal. This award is given every year to the author and illustrator of the most distinguished informational book for children. I am always fascinated by the range and depth of information books that this award recognizes.